Hip Hop Karaoke NYC :: Blog: 2010 Hip Hop Karaoke Championship - TONIGHT! This is it, folks. 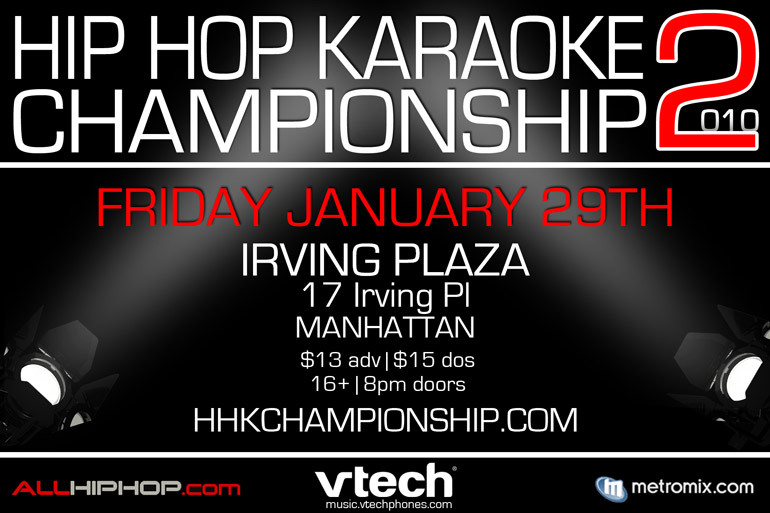 They've been practicing for months, made it past regional championships and now 12 of HHK's finest are ready to compete in the 2010 Hip Hop Karaoke Championship at Irving Plaza. They'll be judged by Hip Hop royalty. If you haven't already, meet the 12 competitors: Damali, Jason, K-Dot, Chef, Diego, RDJ, Santiago, Jessica, Thomas, Charlie, Doni D, and Dashaun. These 12 great people will be representing HHK on the big stage tonight! Any remaining tickets will be available at Irving Plaza starting at 8:00 p.m. Last year's event sold out shortly after doors so if you want to ensure entry, grab 'em now. Don't forget to head over to Allhiphop.com, Metromix.com and VTech, the three hardest-working crews in the business. Doors at 8, show starts around 9/9:30. Hit us up with any questions and see you at the Championship! dope. did anyone tape the HOT 97 interview w/ Rosenberg?